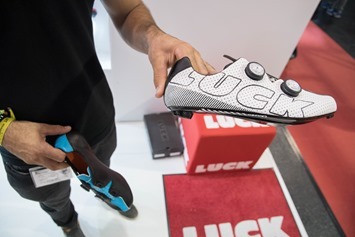 It’s been a few years since Luck first showed off prototypes of their cycling shoe with a built in power meter. In previous years it was rarely prominently displayed. It was sorta available to see on special request. 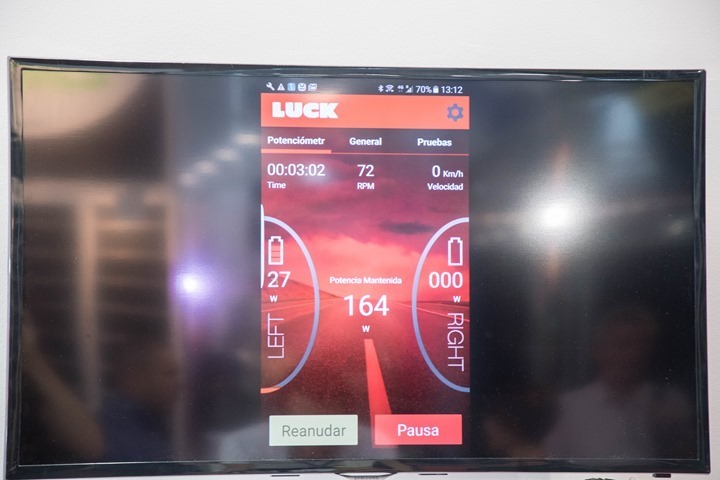 The Spanish company is known for making cycling shoes, not so much power meters. But this year it was out in full view and with a display element that took up about a third of the booth – complete with a cyclist pedaling away on a bike. Now before we talk about the power meter piece, we need to start with the understanding that this only works with their cycling shoes. 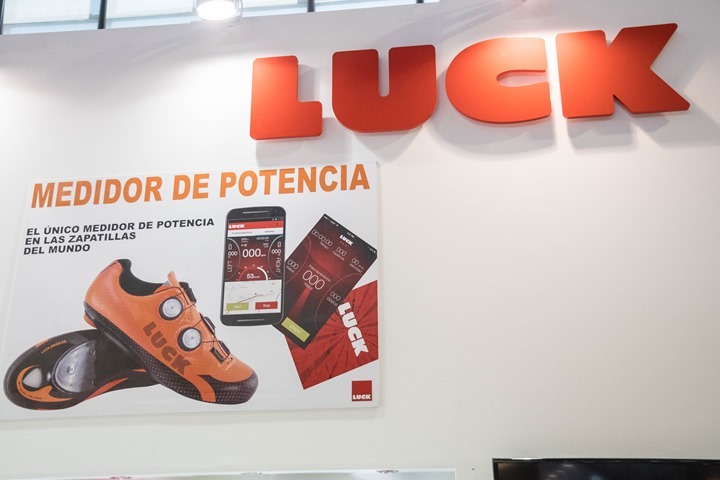 The good news is that it works with all of their cycling shoes, from their 50EUR ones up to their 350EUR editions. So you don’t have to get a pricey cycling shoe to make this work. The two ends of that price range seen below. Now the reason you need their shoes is that it essentially snaps onto the bottom of the shoe. Start by looking at the bottom of the shoe below. That unit has the power meter on it. 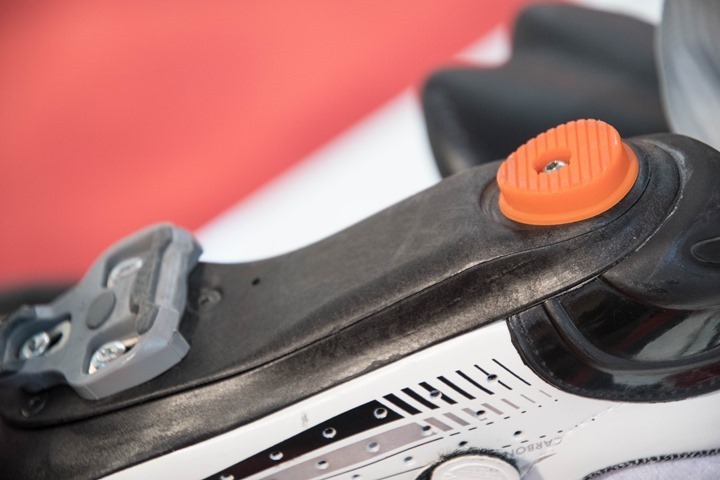 Notice how it has a bit of an ‘edge’ or secondary plate along the bottom from the back of the orange piece up to the cleat? Like a secondary level? You can see that there’s a small secondary riser that’s put in place that includes the power meter measurement piece. That’s where everything from the communications stack to the strain gauges and the battery all sit. Basically, all the typical components of a power meter fit within that area. So at first glance the price is actually quite reasonable – in fact, the cheapest of any power meter out there. 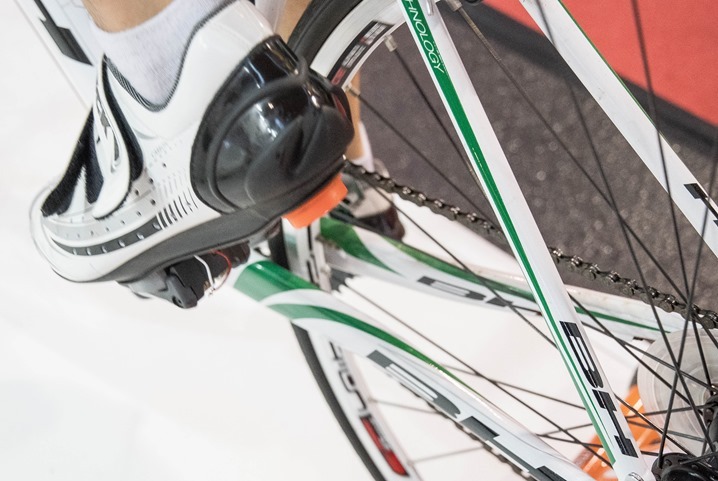 You have to buy their shoe, but even taking that into account your minimum price would be 250EUR, which is well below any others for a direct force power meter (DFPM). I will note my Spanish is limited to Hola, so our communications were limited. So we validated prices via the calculator/notepad apps, just to be sure there. Same with other specs. Still, there’s room for errors in any non-native speaking scenario. But you can validate most things here on their page. Now in this demo, only the left side seemed functional. An observation I doubled-down on while editing these photos now and noticed small wires coming out of the shoes. That matches with our conversation and taking me around to the right side of the bike to show me that shoe. My guess is that shoe isn’t actually functional, but more ‘pretty’ instead. This matches the exact set of circumstances that the Bikeradar folks got too. Which isn’t a huge problem per se, but it re-enforces my gut feeling that we won’t see these per their timelines of Q1 2017. In fact, they initially said in our conversation late 2016, but then backtracked to Q1 2017. My bet is we’ll see them next Eurobike (August 2017), but, at that price point if they can make that happen – that’s a pretty huge thing. It would allow folks to choose any cleat type they’d like, and any bike configuration they’d like. It’d be the ultimate in bike portability. And perhaps by then they can get that 10-hours of battery life up a bit, because frankly, 10 hours is a non-starter. In my opinion the absolute minimum threshold here is 20 hours of claimed spec. The wireless charging does soften that blow slightly though, since you could just toss them on a wireless charging pad (in our conversation it sounded like the exact same pads as for wireless phones today) versus having to plug them in. In any case – as I like seeing both new competitors, but even more so new power measurement spots and ways to expand the technology as new price points. If they had a 200EUR per side in my shoes with my existing cleats that’s both accurate and gets a bit more battery life, I’ll definitely be the first customer for it. That’d be cool. From the third ‘graph, you quote the shoe price as “The good news is that it works with all of their cycling shoes, from their 50EUR ones up to their 350EUR editions.” However, later, you note the minimum is €250. My reading of the site seems to point to the higher figure. The 50EUR-350EUR figure is for the shoe itself, without the power meter. Then you add the 200EUR for the power meter, hence where I was getting 250EUR from. Where do you see something else? No, as you state it, the is math correct. I was confused about the wording, apparently. And on a side note, if this product comes to market near the projected price (and date), it’d fly off the shelves. Being able to adapt this to practically any pedal system irrespective of components (crank-, pedal-, and hub-based systems) is truly a game changer. My ideal use for these would be on a gym’s spin bike when carrying pedals, wrenches, etc, is less than ideal. Assuming my SPD three-hole conversion plate would work on this, this method is would easy to implement. Indicating maybe that the system isn’t compatible with their lower end shoes (unless this has changed since that article). Would put the pricing for left only at €400 – €500. Yeah, we actually had a fairly in-depth discussion about it being compatible with anything (it’s what led to the photo of him holding up both shoes at once). But it also wouldn’t surprise me if there were still language issues there. So, if I’m reading this right I would be able to buy the Luck shoes and get the left only power meter to start and upgrade pretty easily to left/right power at a later date. Is that correct? If so, I think I’ll be the second person in line, right behind you. I have some doubts concerning durability… I mean, my usual cycling shoes are pretty beaten up after 2 years and more than a few thousand kilometers. I am not sure those electronics can hold up to that protected by – what looks like – a thin layer of (albeit re-enforced) plastic. What are you doing g to your shoes? My S-works from 2006 are still in respectable shape. I agree with you to a certain extent, however, at these price points (and the only direction to go is down from here), a life expectancy at the low end of 2-3 years would not be bad at all. Please let this really happen!! It’s the holy grail of power meters. I already have a PM on every bike I own and I’d STILL go out and buy this if only to have power when going to spin classes! Any cleat type or any 3 bolt road cleat. I’m married to 2 bolt SPD. I’m older and a little too unsteady to eat or drink while riding, especially on urban roads and I like that cleat and shoe for all the stops. So far only Stages and Power2Max seem to fit my, er, well, not need but definitely want. Ditto on the two bold SPD primarily because of the multi angle quick release and alternative shaft length needed after having an ankle reconstructed with metal screws. Still, I’d put the S-Works into the closet and purchase a new set of shoes at this price point. Even better if I could swap between road and mountain bike shoes. As always said… pretty much anyone can make a powermeter to the 90%-95% point…thats when it gets difficult. This could be really a revolution! You choose the crankset, the pedals and the setup that you want.. No switch between bikes needed, you could also use it on rental bikes if you travel. If it will be precise I will buy for sure… When will see a real test? I’m curious as to how they can accurately distinguish tangential and radial forces. 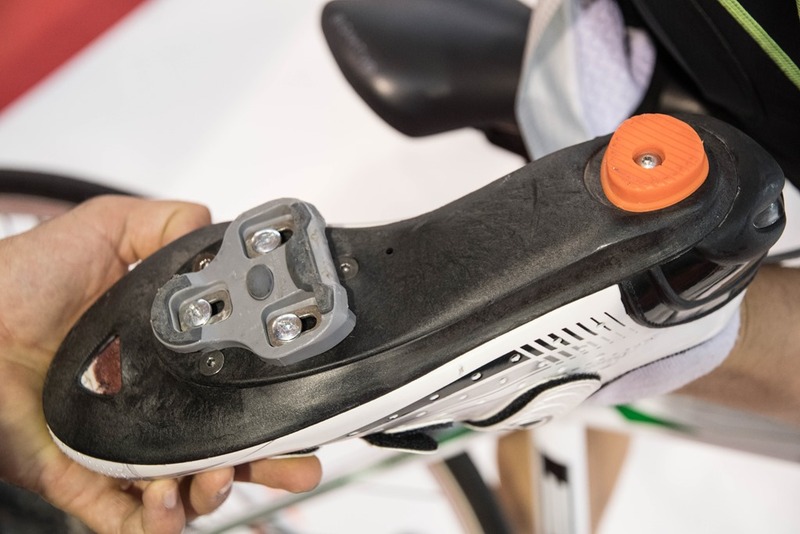 Looks tricky to measure heel scraping type movements or to reliably work out the angle of the shoe in relation to where it is in the pedal stroke. I’m guessing that it has an accelerometer (like pedal-based systems) which would detect where in the pedal stroke the shoe is. But I agree that seems like it could be a major source of error. Especially since a shoe isn’t necessarily at a known angle at any given point. With a pedal-based system, you know that the strain gauges in the spindle are fixed to the reference frame of the cranks. But the shoe could be at any angle, likely pretty close to horizontal on the downstroke and slightly toe-down on the upstroke. But again I’m not sure how you accurately measure that to take it into account. Just adding to the comment. Keith Hack recently posted a blog entry due to Brim Brothers bowing out. So you can buy a set of shoes and get either left, right or both meters attached right? What happens when you only go for the one shoe option in terms of shoe height? 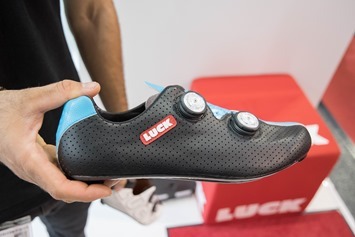 surely one shoe cleat will be higher than the other or do they give you a plastic plate to just fill in the other shoe that doesn’t have the power meter? Otherwise i can see a lot of people hobbling about like John Wayne at the coffee stop. I’m interested to see how the increased stack height works out. I know there are spacers that fitters can use to fix imbalances, wonder if it will impact action on Look/SPD-SL pedals. Just so you are all aware this looks like a piezo electric sensor. No strain gauge. They work on changing resistance as pressure is applied through the ball of the foot which can then be converted to how much down force is being applied through that area of the foot. It will not generally detect upstroke ‘pull’. There are similar products measuring insole forces for gait analysis ie Moticon insoles. The sensor are quite cheap, are guaranteed for ?100 000 000 actuations (300 hours of cadence of 90) but often need ‘calibrating readings’, have hysteresis issues, temperature fluctuations. Aka similar problems to strain gauges. I bought a raspberry pi & a collection of sensor for $100 in a vain thought I could do a Hackaday type DIY power meter. Lack of time & intellect defeated me early on in this. Any update on availability? I’m firmly sitting in the ‘I would buy this’ camp. Seems pointless contemplating anything else with this on the horizon. I haven’t heard anything. And honestly, I really wouldn’t expect anything. They’re just nowhere near where they think they are. Any more news on availability? Have these guys been to any summits lately or updated their status? I’m in the market for new shoes and would be willing to hold off until next season – tho their website doesn’t give any details other than they aren’t available yet. Hi Ray – The Luck shoe-based power meter seems like it’s got so much cool potential. Any word on whether they’re bringing them to market anytime soon? Thanks!